College students walk between classes on a campus in New York, February 2017. This report outlines seven proposed principles to improve U.S. Department of Education efforts to protect the $125 billion annual investment in federal financial aid. The story of three-year student default rates is a microcosm of the issues surrounding federal higher education accountability. Policymakers expended substantial time and political capital to get the measure included in draft Higher Education Act bills. However, fierce lobbying from special interests watered down the measure before it became law.5 And when it finally went into effect, the U.S. Department of Education made technical tweaks to further reduce the number of schools that might fail to avoid potential political backlash.6 The result is a major accountability change that did nothing more than put a handful of beauty schools out of business. A decade later, the same discussions around higher education accountability are back on the table. Student loan struggles persist, and many existing measures intended to raise red flags can be manipulated and fail to catch all the problems.7 Fortunately, Congress is again working on another reauthorization of the Higher Education Act, which means that now is the time for a national conversation about changes or new forms of accountability. This report takes a closer look at the Department of Education’s federal accountability structures concerning financial aid and discusses the efficacy of these efforts. These structures ensure that students use their aid money at high-quality institutions that provide valuable opportunities. The report also lays out a set of principles for improving future accountability efforts. To keep this effort manageable, this report does not consider other key parts of the financial aid accountability system—states and nonprofit accreditation agencies that combine with the federal government to constitute what is known as the triad of oversight. Nor does it consider other important rules and regulations outside of the Department of Education, such as requirements concerning nondiscrimination, accessibility for individuals with disabilities, or labor practices or rules governing nonprofit organizations from the Internal Revenue Service. Overall, this report finds that any effectiveness of federal accountability concerning financial aid likely occurs through deterring rather than penalizing unwanted behavior, because existing tools are ineffective for sanctioning institutions after they have demonstrated worrisome outcomes. For instance, the parts of the accountability system that require institutions to meet numerical targets—such as cohort default rates—have negative consequences for only a tiny number of schools and just a small fraction of federal aid dollars. In the most recent year of data, just 252 schools of the more than 6,000 higher education institutions in the federal student aid programs failed one of the three main quantitative standards measuring student loan default, financial health, or the share of revenue that for-profit colleges receive from the Department of Education. In total, these 252 schools received $1.7 billion in the 2015-16 academic year—just over 1 percent of all federal financial aid dollars.10 And the actual amount of federal aid truly at risk for these colleges is even lower, because schools must fail measures multiple times consecutively before they lose access to federal aid programs. To be fair, the fact that few institutions face consequences from federal accountability does not necessarily indicate that existing measures are completely ineffective. It is entirely possible that some measures may create sufficient incentives to discourage unwanted behavior. In other words, even though few institutions have default rates high enough to trigger sanctions, a larger number of schools may work to prevent default among their borrowers to avoid potential problems. Unfortunately, there is no precise way to calculate the extent to which current federal accountability measures have any sort of preventative effect. Federal accountability measures that do not rely on clear numerical targets have a similar dynamic of sanctioning relatively few schools with unknown preventative effects. Many of these accountability initiatives, such as annual compliance audits of colleges, focus on a set of technical questions related to institutional finances and compliance with laws and regulations regarding the handling of federal aid dollars. While it is valuable to guarantee that federal financial aid dollars are spent properly, this myopic focus on procedural details may sometimes miss larger signs of concern. Federal accountability also does not consider how federal financial aid dollars interact with other sources of college support. Unlike in the K-12 education sector, federal postsecondary accountability contains no checks to prevent states and institutions from using federal financial aid money as an opportunity to spend less of their own resources on low-income students. The absence of such federal requirements makes it easier for states to cut their own funding for higher education. It also allows institutions that have their own financial aid programs to put those dollars toward attracting students who are less in need of support—reinforcing the inequity in America’s educational system. Overall rates of completion are also ignored by current accountability systems. Just 55 percent of students who enter higher education will earn a degree six years later.14 Students who drop out, particularly those with debt, face worse economic outcomes and are more likely to default on their loans.15 Yet no part of the federal accountability process touches on this issue. Failing to have any accountability around college completion is like establishing an airplane safety regime that never tracks whether planes land. Fortunately, the problems identified in this report can be fixed through a thoughtful reimagining of federal accountability. This approach requires refocusing accountability efforts on acute problems while encouraging quality improvements for students across all institutions, not just the lowest-performing ones. There is also no single path to achieve these aims. Different combinations of accountability metrics, monitoring processes, and upfront protections can push the accountability system toward these goals. Therefore, it is crucial that any concrete proposals receive significant debate through the legislative process. Target accountability to the most concerning problems. Recognize the different roles of gatekeeping, ongoing monitoring, and outcomes accountability. Align consequences with accountability measures. Adopting these principles would reorient today’s system of federal accountability for financial aid toward one that is better geared to tackle the most pressing issues challenging postsecondary education today. They place stronger emphasis on flexible consequences and the need for overall improvement, not just targeting the worst of the worst. An approach based on these seven principles would also reduce the focus on less important technical matters. The end result would be a postsecondary system better equipped to ensure that all students who enroll—regardless of background—receive a credential that sets them up for lifelong success. For the purposes of this report, accountability means any U.S. Department of Education statutory or regulatory requirement that puts an institution’s ability to receive federal financial aid at risk due to its performance in areas directly related to student learning, loan outcomes, institutional finances, or other matters related to the purpose and use of these funds. For example, cohort default rates are an accountability requirement, because an institution must keep the percentage of its borrowers who default on their loans within three years of leaving school below certain benchmarks. The institution’s performance on that measure thus directly affects its ability to receive federal financial aid. This definition of course fails to capture a substantial number of other valuable accountability efforts. The most obvious is the work done by states and nonprofit accreditation agencies. The U.S. system of higher education oversight rests on a concept known as the triad. The idea is that the federal government, states, and accreditors work together to ensure quality at postsecondary institutions. In theory, the triad provides a way to divide up accountability work based on who is best suited to look at certain elements of a postsecondary institution. For instance, accreditation agencies inarguably are the part of the triad that must look at educational practices across all types of institutions. The federal government is not equipped to do this in any capacity, while state activity around learning varies and often focuses only on public institutions. Limiting the report’s focus to the Department of Education’s work around financial aid also excludes other important federal oversight activities. Some of these are requirements that apply to basically all types of businesses or organizations. This includes rules pertaining to discrimination, accessibility, labor practices, and similar activities. It also excludes issues more unique to colleges, such as research practices or receipt of foreign gifts. Additionally, this focus does not tackle requirements around campus crime and fire safety. These issues are important but are not directly related to practices that affect financial aid. This section reviews the accountability mechanisms currently in effect, broken down by whether they are gatekeeping, ongoing monitoring, or outcomes-based. It also highlights key strengths, weaknesses, and ongoing policy debates. Gatekeeping requirements are processes required of institutions of higher education that wish to join the federal financial aid programs, including accreditation and withdrawal rates. What is it? Accreditation is a third-party review process in which an independent agency looks at an institution of higher education to ensure it is of sufficiently high quality to participate in the federal financial aid programs. What problem does it attempt to solve? Accreditation relies on the peer review process to ensure that colleges receiving federal financial aid are of sufficient quality, particularly with respect to teaching and learning. What authorizes it? Sections 101 and 102 of the Higher Education Act require institutions to be accredited in order to receive access to federal financial aid. What does it measure? Exactly what accreditors look at varies somewhat by agency. Some accreditors that approve colleges across the country require institutions to meet specific benchmarks for completion, retention, placement, student satisfaction, or some combination of these measures. Accreditors that only operate in defined geographic regions do not have bright line benchmarks, though they may ask institutions to report student outcomes data. Beyond clear measures, accreditors will send a team of peer reviewers to visit a college, which includes looking at the qualifications of faculty, sufficiency of facilities, evidence of student learning, and financial health. What institutions are subject to it? All institutions that want to receive federal financial aid must be accredited by an agency that is recognized by the Education Department. What is the required performance level? Each accreditor sets its own standards. Federal law requires them to have standards in specific areas—such as student achievement—but accreditors determine what constitutes sufficient results in that category. When accreditors decide that an institution does not meet their standards, they can warn a school, place them on an improvement plan, or remove their accreditation. Institutions that lose accreditation cannot access federal financial aid until they obtain approval from an agency again. What does it do well? Accreditation is the only part of the triad that universally looks at issues around teaching and learning at institutions of all types. Accreditation has strong support from institutions. What is it? Withdrawal rate is the measure of how many students who start at a school drop out before the end of the year without graduating. What problem does it attempt to solve? It protects against providing federal financial aid to new institutions with high dropout rates. What authorizes it? The Department of Education’s regulatory interpretation of requirements from Section 498 of the Higher Education Act requires an institution to demonstrate administrative capability in order to participate in the federal financial aid programs. What does it measure? The rate measures the percentage of students who start at a college and officially or unofficially withdraw, are expelled, or receive a 100 percent refund. What institutions are subject to it? Only colleges seeking to participate in the federal financial aid programs for the first time must meet certain withdrawal rate benchmarks. How many institutions does it sanction? The Department of Education does not publish data on these schools, so this number is unknown. What does it do well? There is not enough information about its use to tell, so this information is unknown. Ongoing monitoring requirements are processes that institutions of higher education must follow each year once they are in the federal aid programs in order to maintain eligibility. These measures include financial responsibility scores, the 90/10 rule, program reviews, and annual audits. What is it? A rule that requires private for-profit colleges to have at least 10 percent of their revenue come from sources other than federal financial aid from the Department of Education. What problem does it attempt to solve? This rate is a test of whether private for-profit colleges can demonstrate that their product is good enough to draw private funding and can show that it does not rely entirely on the Department of Education. What authorizes it? Section 487 of the Higher Education Act requires private for-profit institutions to meet this revenue test. What does it measure? This requirement measures the percentage of institutional revenue that comes from the Department of Education. The agency uses data from a school’s audited financial statement to calculate the 90/10 ratio. What institutions are subject to it? All private for-profit colleges that participate in the Education Department’s federal financial aid programs. What does it do well? The revenue requirements provide a valuable check on purportedly private institutions operating entirely on federal taxpayer money. What is it? These audits are an external review of an institution’s finances or compliance with federal aid rules conducted by an independent, private auditor. What problem does it attempt to solve? Audits provide independent oversight to discourage colleges from breaking rules around aid awarding, operating in a financially unsustainable manner, or lacking qualified administrators to run the school. What does it measure? Audits take two main forms depending on the type of school. Compliance audits of for-profit colleges review a random sample of student files to ensure that they comply with financial aid-awarding and eligibility rules. Institutions must correct identified problems. Public and private nonprofit audits are different and more expansive. These schools submit what is known as a single audit that reviews a school’s finances and covers all types of federal assistance received.32 For example, an audit from a public college may touch on federal financial aid as well as research dollars received from the National Science Foundation. Financial audits also provide the information used to calculate 90/10 rates and financial responsibility scores. What institutions are subject to it? All institutions receiving federal financial aid must submit an audit to the Education Department. What is the required performance level? There is no set threshold. Institutions with problematic audit findings may be subject to additional monitoring or compliance work. This can include delays in the disbursement of funds. Private colleges that show a failing financial responsibility score based upon the audit results can also face consequences discussed earlier. Private for-profit colleges whose audits show that they violate the 90/10 rule can also face consequences, as noted earlier. Finally, an audit revealing numerous problems could potentially trigger a program review. How many schools does it sanction? It is unclear how often audits cause problems for institutions of higher education. According to Education Department data, 29 schools had letters of credit on hand in the 2015 academic year due to missing audits.33 But there are no data on how many schools have problems with audits that require policy changes or must return federal money. What does it do well? Involving auditors provides an independent check on information reported by institutions, increasing confidence in data accuracy. In addition, auditors likely have greater financial expertise than most oversight staff within the Education Department. What is it? This is a composite score that attempts to measure the financial health of private nonprofit and for-profit institutions based upon information filed in annual financial audits. What problem does it attempt to solve? Financial responsibility scores try to identify private colleges that might suddenly close by keeping an eye on a school’s financial health. What authorizes it? The Department of Education’s regulatory interpretation of requirements from Section 498 of the Higher Education Act states that an institution must demonstrate financial responsibility in order to participate in the federal financial aid programs. What does it measure? The financial responsibility score is a composite of three indicators: primary reserves, which examine resources versus expenses; equity, which measures the percentage of assets that a school owns and is a measure of ability to borrow; and net income, which calculates how much revenue a school earns above expenses.37 The exact definition of these measures depends upon whether the private school is nonprofit or for-profit. What institutions are subject to it? This score applies to all private nonprofit and for-profit institutions. What is the required performance level? Financial responsibility scores range from -1.0 to 3.0. Institutions that score above 1.5 are deemed financially responsible.38 Schools with scores between 1.0 and 1.5 fall into a zone category that requires additional monitoring. This can include potential delays in the payment of federal aid to students. In addition, these schools must inform the Education Department of any substantial financial changes. Schools scoring below 1.0 are not financially responsible and have two options to remain in the financial aid programs: Schools can submit a letter of credit equal to half of the federal financial aid received each year; or schools can submit a smaller letter of credit equal to just 10 percent of the federal financial aid received but then become provisionally certified to participate in the aid programs. Provisional certification affords schools fewer due process rights if further problems arise, meaning that the secretary of education may more easily terminate their participation in the federal financial aid programs. How many institutions does it sanction? According to Education Department data for the 2014-15 academic year, 187 institutions had a failing financial responsibility score.39 Of these, 65 were nonprofit and 122 were for-profit institutions. Another 139 schools were in the zone, meaning they had a score between 1.0 and 1.5. What does it do well? The scores look at important issues, such as whether an institution has enough liquid assets to cover its operating costs, whether an it is sufficiently capitalized, and whether it can operate within its budget. What is it? This is a Department of Education review of an institution’s compliance with federal financial aid rules, among other issues. What problem does it attempt to solve? A program review typically judges whether institutions of higher education follow technical rules related to the awarding of federal financial aid. For instance, program reviews may check that financial aid funds are returned when a student drops out, that proper documentation is in place to ensure that a student is eligible for aid, and that necessary student information is verified. Program reviews can also check that other rules are enforced, such as bans on offering compensation incentives to recruit students or complying with crime-reporting requirements. What authorizes it? Program review authority originates from Section 498A of the Higher Education Act. What does it measure? A program review does not involve set benchmarks and can take multiple forms. The most common iteration involves taking a random sample of roughly 30 student files and checking them to ensure that they meet required financial aid packaging and awarding deadlines, among other requirements. This is a process similar to that used in compliance audits of private for-profit colleges. Program reviews can also take targeted looks at areas such as crime reporting. What institutions are subject to it? Any school that receives federal financial aid can be subject to a program review. However, because they are resource-intensive, only a few hundred schools face a review in any given year. Schools are typically selected for review through a risk assessment. What is the required performance level? There is no set performance bar. Rather, the number of problems identified in the random sample can trigger further investigation. Two things could happen to schools when program reviews uncover problems: The institution may be forced to pay back some amount of financial aid dollars that reviewers decide were misspent—the payback could either be only the amounts turned up in the random sample or an estimate of the total liability for the problem across the institution—or the institution could be required to change a given practice to avoid problems in the future. How many institutions does it sanction? In the 2016 fiscal year, the Education Department published 141 final program review determinations.42 However, just because an institution has a program review conducted does not mean that problems turned up. A CAP examination of a subset of program reviews conducted over a span of three years found that the majority of schools do not end up with any assessed liability, and only one or two schools received penalties of more than $1 million.43 The number of program reviews finalized is also not the same as the number initiated in a given year, because some reviews may take a few years to finish. What does it do well? In theory, program reviews have a lot of flexibility to tailor reviews based on each institution’s problems, allowing investigators to conduct deeper dives in problematic areas. This is also the only area where Education Department staff can regularly take close looks at important operational aspects such as marketing and recruitment. These are measures that require an institution to demonstrate that its students meet certain performance bars. Institutions that fail to meet these performance thresholds risk losing access to federal financial aid. These measures include cohort default rates and gainful employment. What is it? The cohort default rate is the percentage of student loan borrowers who default within three federal fiscal years of entering repayment. What problem does it attempt to solve? Congress created the cohort default rate to shut down institutions of higher education that had too many students defaulting on their loans. The goal was to bring down the national student loan default rate. What does it measure? The rate measures all student loan borrowers who enter loan repayment in a given federal fiscal year. This includes both graduates and dropouts. Students who borrow an unsubsidized Stafford loan for graduate school are included in the measure, but Grad or Parent PLUS loans are not. In other words, graduate students who default on a Grad PLUS loan but not in his or her Stafford loan are not counted as a defaulter. The same is true of Perkins loans awarded by schools. What institutions are subject to it? Cohort default rates apply to all institutions of higher education that participate in the federal student loan programs. What is the required performance level? Institutions must keep their default rate under 40 percent in any given year or risk losing access to federal student loans. An institution whose default rate exceeds 30 percent for three consecutive years loses access to federal financial aid. That said, institutions have several options for appealing their default rates. They can show that a low percentage of their students borrow, servicing problems caused the high default rate, or that at least two-thirds of their students are low-income and that it met certain thresholds for job placement rates. What does it do well? The specific focus on default sends an important signal about the need to keep students out of this dire situation. Though few institutions fail this measure, the threat of losing financial aid through this process does spur attempts to keep students from defaulting on loans, at least within the measurement window. What are the common criticisms of it? Many elements of the cohort default rate make it a relatively weak measure. First, institutions may be able to keep their default rates artificially low by encouraging borrowers take advantage of repayment options that pause payments for years without defaulting. Doing so pushes eventual defaults outside the three-year measurement window. Second, the use of these payment-pausing options, in addition to the ability to tie loan payments to a borrower’s income, enables many borrowers to avoid default without making any progress paying down their debt. Some institutions with low borrowing rates, meanwhile, complain that cohort default rates mean that a small number of student borrowers could put federal aid at risk for a much larger set of grant recipients. What is it? Gainful employment is a regulation that requires career training programs to ensure that the typical debt levels of their graduates who received federal financial aid do not exceed a certain share of their earnings. What problem does it attempt to solve? Gainful employment guards against programs that cause graduates to take on too much debt relative to what those students earn in the workforce. What authorizes it? The gainful employment rule is the Department of Education’s regulatory interpretation of requirements from Section 102 of the Higher Education Act. What does it measure? Gainful employment assesses programs on two debt-to-earnings ratios. The annual debt-to-earnings rate compares a program’s mean or median earnings to its median annual debt payment. The discretionary debt-to-earnings rate adjusts the typical earnings for a program by subtracting 150 percent of the federal poverty level for a single individual—about $18,090 in 2017.52 It then compares this amount to the median annual debt payment. This second measure looks at what a borrower can afford after setting aside money for key living expenses such as rent, food, and transportation. For this reason, debt is allowed to make up a higher level of earnings under the discretionary measure. What programs and institutions are subject to it? The Higher Education Act defines the types of programs affected by this rule. All nondegree programs that participate in the federal financial aid programs are subject to the gainful employment rule. This includes certificate programs at public and private nonprofit colleges. Degree programs at private for-profit colleges are also subject to the rule. What is the required performance level? Programs with an annual debt-to-earnings rate at or below 8 percent or a discretionary debt-to-earnings rate at or below 20 percent face no consequences. Programs with an annual debt-to-earnings rate above 12 percent and a discretionary debt-to-earnings rate above 30 percent fail the rule. Programs that fail twice in a three-year period lose access to federal financial aid. Programs that neither pass nor fail—such as having an annual debt-to-earnings rate of 10 percent and a discretionary rate of 25 percent—fall in what is called a “zone.” These programs must pass at least once in a four-year period or lose access to federal financial aid. What does it do well? Placing the focus on a school’s individual programs instead of on the overall institution allows for a more targeted accountability approach. It also introduces actual earnings information for the first time in the federal education accountability process. What are the common concerns or criticisms of it? There are two major flaws in gainful employment from a consumer perspective. First, the measure only looks at the outcomes of graduates from a program, allowing programs with high dropout rates to potentially still pass. Second, since one gainful employment measure is a simple debt-to-annual earnings comparison, it is possible for programs that cannot produce family sustaining wages for graduates to still pass. Institutions, meanwhile, criticize gainful employment for affecting private for-profit colleges more than other types of institutions and attribute the results observed to the demographics of the students enrolled. How many institutions come close to facing sanctions? The use of bright line standards in several accountability measures creates conditions where institutions are close to failing thresholds without facing sanctions. These are institutions where accountability theoretically encourages improvement, since these schools will want to avoid consequences—specifically fines and potentially the loss of access to federal aid. Table 2 compares how many institutions fail to meet required thresholds for various accountability measures versus how many come close to those benchmarks. The table considers a school “close to failing” if it is within 5 percentage points of the cohort default rate cutoff or the 90/10 ceiling. For financial responsibility scores, it considers schools close to failing if they are within one-half of a point of scoring a 1.0—the threshold where an institution must submit a letter of credit. For accreditation, an institution is close to failing if it faced a serious sanction, such as probation or show cause. The table also considers only one year of performance data for quantitative measures. In reality, most measures require failing for multiple years before the most serious consequences occur. As the table shows, very few institutions fail these measures. Financial responsibility scores have the largest effect, with 5.5 percent of private colleges producing failing scores. For other measures, there are more schools that just avoid triggering consequences—a result that is at least partly a reflection of the fact that institutions actively manage their performance to avoid sanctions. Evaluating federal accountability processes is a subjective exercise. Differing opinions on what problems need to be solved and what a given measure should be able to accomplish yield very different frameworks for declaring an accountability indicator effective or ineffective. The cohort default rate measure provides an example of the subjective nature of judging whether an accountability measure works. If the purpose of cohort default rates is bringing down the rate at which borrowers face this horrible consequence, then the measure might be viewed as effective. For instance, the percentage of borrowers defaulting on their loans within three years of leaving school fell for three consecutive years before rising by two-tenths of a percentage point in 2017.54 And institutions clearly work proactively to bring down their default rates.55 Similarly, the low number of institutions that face sanctions under this measure might also suggest that cohort default rates do a good job encouraging colleges to better serve borrowers. An alternative way of judging cohort default rates, however, produces a different assessment. If the cohort default rate measure supposedly encourages colleges to improve student loan repayment, then it appears quite ineffective. Consider the interplay of default and nonrepayment rates—the percentage of undergraduate borrowers who defaulted or have not paid back at least $1 of their original principal loan balance within three years of entering repayment. Using data from the College Scorecard, CAP compared the change in three-year nonrepayment rates for students entering repayment in 2006 and 2007 with the rates in 2011 and 2012, as well as the change in the two-year cohort default rate over the same time period.56 Overall, 360 institutions lowered their cohort default rates. Of these, just 23 also lowered their nonrepayment rates. Meanwhile, over 250 of these institutions had their nonrepayment rates rise by at least 10 percentage points.57 For example, the now-shuttered Everest College in Reseda, California, saw its two-year default rate nearly halve, going from 15.6 percent to 8.6 percent. At the same time, its nonrepayment rate rose from 52.8 percent to 78.5 percent.58 It is possible that part of this discrepancy is due to the inclusion of graduate students in the default rate, because they tend to have better loan outcomes than undergraduates. However, the fact that so many institutions could be lowering their default rate while the nonrepayment rate of their students actually rises suggests that common tactics for preventing default do not translate into student loan success. Given the complexity and subjectivity of assessing whether federal accountability works, this report provides two ways of considering the question. One way is punitive: Accountability could work by aggressively capturing many institutions. The other is curative: The possible consequences of accountability measures dissuade unwanted behavior before it occurs or pushes institutions to substantially improve if they initially fail an indicator. Overall, federal accountability for financial aid comes up short in terms of sanctioning institutions after they demonstrate poor outcomes. Its curative effects, meanwhile, are more difficult to assess given existing data. Few schools fail federal accountability measures based on numeric benchmarks, and those that do typically have small enrollments. Monitoring processes such as audits and program reviews focus on narrow technical issues that typically result in small fines. Accreditation, meanwhile, rarely terminates federal aid eligibility for institutions. Table 3 shows the number of institutions facing a given accountability sanction, as well as the median and total amount of federal financial aid received in the 2015-16 academic year for all schools that fail a given measure. It does not include gainful employment results, since those operate at the programmatic level, and it is unknown how much federal aid a given program received. The institutional counts in this table may also not match figures presented elsewhere in this report because some institutions may have exited the financial aid programs after facing accountability issues in the past. 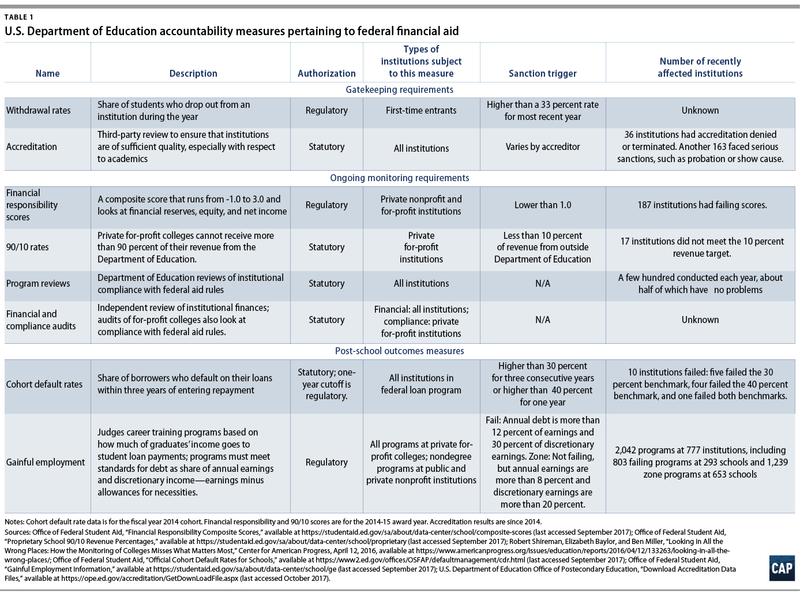 As the table shows, the three main accountability standards that require institutions to meet some numerical benchmark—cohort default rates, 90/10 rates, and financial responsibility scores—affected just 252 institutions, which received a total of $1.7 billion in the 2015-16 academic year, or slightly more than 1 percent of all federal student aid funding for that year.62 This figure also overstates the potential amount of aid at risk, because institutions have to fail measures multiple times over several years before losing access to these federal aid programs. 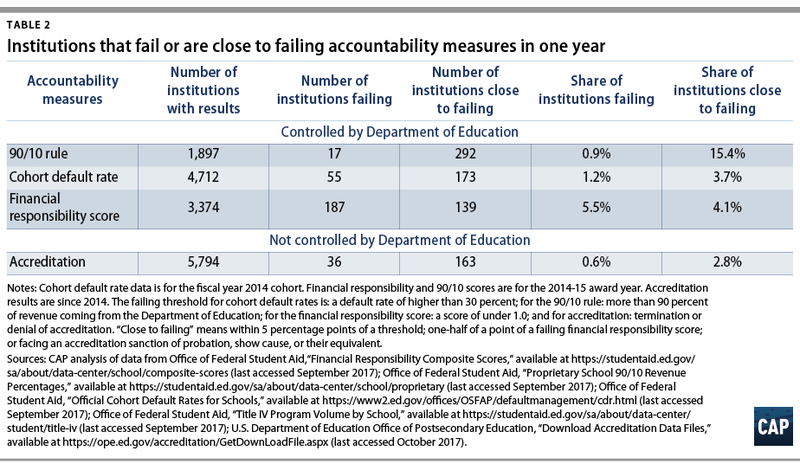 The small proportion of federal aid received by institutions that failed these accountability measures further highlights the fact that only small schools get trapped. 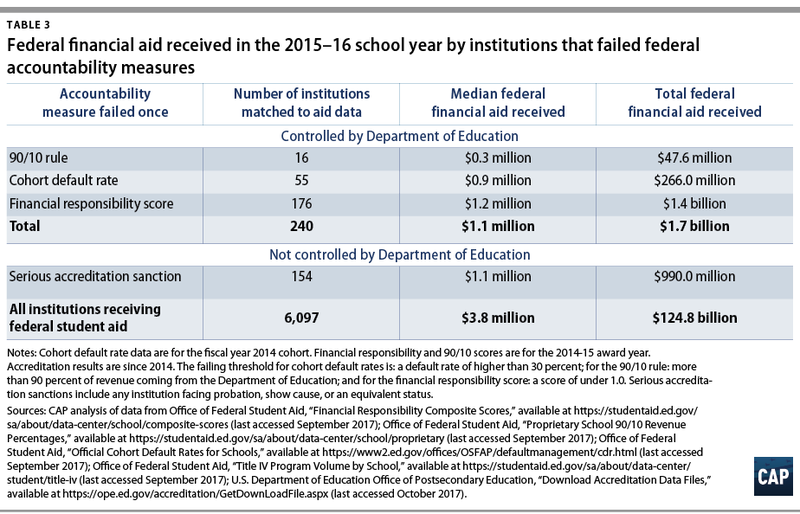 The median amount of federal aid received by institutions that failed the cohort default rate or 90/10 test was less than $1 million. By contrast, the median amount of federal aid received by colleges participating in the federal aid programs totals nearly $4 million a year.63 Moreover, the 12 colleges that failed the cohort default rate or 90/10 tests enough times to lose access to federal aid in total received just under $20 million in federal aid. The seeming ineffectiveness of the financial responsibility score may be a result of its implementation lag time. For example, at small schools, missing enrollment targets could result in a big drop in revenue that could cause a school to close. That revenue drop would be felt in the fall. But financial responsibility scores are calculated from balance sheets at the end of an institution’s fiscal year, which often is June 30, before the problem is likely to arise. Nonprofit colleges then have nine months to submit the audit; for-profit colleges have six months.65 This results in a lag. If an institution experiences an enrollment shortfall in fall 2016, it does not report the financial data capturing that problem to the Department of Education until 2018—at least 18 months after it occurred.66 Unfortunately, there is no clear way to correct this delay while still relying on audited financial statements because they take time to produce. It is difficult to judge whether accountability works by dissuading unwanted behavior or encouraging improvement. There are no data on counterfactual situations to determine if a school would have performed worse without the measure. For example, it is entirely possible that accreditation is effective on the front end by denying approval to colleges that would have had abysmal student loan outcomes. But colleges that do not obtain accreditation are not included in any major data collections. These schools also lack any student loan performance information to judge. This means that there is no clean way to tell how well accreditation works in its upfront sorting of colleges. Similar problems arise with other measures. Cohort default rates, financial responsibility scores, and program reviews have all existed for years—if not decades—but data are not good enough to see how schools reacted when these measures were first put into effect. Similarly, data cannot show the path of action an institution took to generate its final result. This makes it difficult to know if performance improved due to preventing problems before they arose or as a result of gaming the measure. For instance, institutions facing high 90/10 rates could bring their figures down in two ways: the right way—reducing prices and recruiting more students willing to pay tuition out of pocket; or the unwanted way—boosting aggressive recruitment of veterans because the financial aid they receive from the VA or DOD counts as nonfederal revenue for this metric. Both approaches would have the same effect on the 90/10 rate even if only one is a desired tactic. As the newest accountability measure, gainful employment provides arguably the best option for assessing whether federal accountability can encourage improvement. The story here is somewhat positive; the first round of official gainful employment data released in January 2017 showed more than 800 programs failing the measures.67 However, because the data reflected the results for students who graduated between July 2010 and July 2012, schools had time to address programs that they thought might fail. As a result, one review of the results found that more than 300 of the failing programs had already closed.68 Though some of these were likely due to institutions closing, it does suggest that schools responded to the threat of accountability by taking concrete steps to eliminate problematic programs. The constant evolution of higher education institutions and their business models means that the effectiveness of different accountability measures is not static. New indicators may be quite effective at first, only to see institutions shift practices and problems arise in other directions. Cohort default rates encapsulate this issue. This measure had a significant effect when Congress first created them. It closed hundreds of lousy, fly-by-night institutions—most of which were private for-profit schools—in its first few years. 69 Then things changed. Instead of small sham schools, many loan problems migrated to the newer, publicly traded for-profit colleges. These institutions were typically not fraudulent in the way schools trapped by the initial default rates were. But some engaged in worrisome practices around recruitment and admission at an unprecedented scale. Default rates, however, have not evolved to capture these problems and now trap very few institutions. The changing and adapting nature of higher education means accountability cannot stay unchanged for years at a time. Measures must be regularly evaluated to ensure that any change in effectiveness is a result of either shutting down institutions or encouraging improvement—rather than due to loophole exploitation—further reiterating that outcomes-based accountability cannot be the only tactic. Long lags between identifying a problem with an accountability measure and correcting it leave students open to exploitation. Robust upfront and ongoing monitoring must also be key components of any oversight system. The existing system of accountability for federal student aid contains important components, but it also has a number of flaws. Measures may be ineffective as implemented, expend too many resources on one set of issues, or fail to target all the colleges that need improvement. Addressing these challenges requires starting with a set of principles that guide accountability development. Future legislative process will be more robust if policymakers take a step back to consider the proper goals, purposes, and structures of accountability. This report provides suggestions for how policymakers could make changes that implement each principle. Recognize the different roles for gatekeeping, ongoing monitoring, and outcomes accountability. An accountability system should create incentives and guardrails that encourage institutions of higher education to tackle the most concerning problems. At its heart, the biggest issue facing higher education today is that its benefits are not equitably distributed. Completing postsecondary education can be a slingshot for economic improvement. College credentials that impart useful knowledge and skills can help students access and succeed in the middle class. A postsecondary degree can improve lifestyles by opening doors to careers that provide access to health insurance and retirement accounts. These careers also can lead to higher wages that translate into the ability to purchase a home or build wealth. However, low-income students and students of color complete college are much lower rates than their wealthier, white peers. Similarly, traditionally underrepresented students are more likely to attend institutions that have fewer resources to educate them. These individuals must also devote larger shares of their income to pay for college, resulting in both a greater likelihood of borrowing and higher levels of student loan debt. Entering into the workforce with a student loan payment puts these students behind their peers, because money spent on loans cannot go to retirement savings or home purchasing. The combined effect of this inequity is that higher education runs the risk of retrenching inequality rather than lessening it. This equity problem manifests in several key ways that accountability needs to address. For each of these—detailed below—the issue is not just that the problem exists, but that there are also meaningful gaps between what happens to wealthier white students and their peers who are low-income or students of color. Completion rates are too low. Nationally, only about 55 percent of students who enter a postsecondary education program earn a credential within six years.70 Moreover, the results are even worse for low-income students, students of color, and students who are older or attend part time. Some programs require too much borrowing compared with their payoff. High tuition is not inherently awful. If a program provides an exceptional return, then a higher price may be acceptable, as long as students can finance it and the dollar figure alone does not dissuade underrepresented students from applying. However, there are too many programs—particularly in the career training space and at the graduate level—where the amount students have to borrow is misaligned with earnings potential. Students in these situations are almost certainly going to struggle repaying their debt without turning to parts of the student loan safety net that reduce monthly payments by setting them at a percentage of income. Institutions may defraud students and then close with no warning and fail to provide funds to cover loan forgiveness costs. Several times in the past few years, massive institutions of higher education—facing concerns about their practices—closed instead of complying with substantial government fines or conditions on operating. In some cases, these schools did have small letters of credit on hold with the Education Department, but the amounts involved represented a small fraction of the total amount of financial aid received by those institutions over multiple years. This failure to both monitor institutions’ finances and hold them monetarily accountable for bad behavior results in college leaders transferring the costs of fraud to the federal government. Financial aid practices can also create equity concerns related to what students must pay for college. Some states and institutions have financial aid programs that direct greater resources to students who lack financial need.76 The result is that lower-income students may face unaffordable price levels that must be met through substantial student loan borrowing. Achieving the aims of the federal financial aid programs in the 21st century requires adopting a broader vision of equity and completion—not just access. This is admittedly a shift from the initial conceptions of the federal student aid programs. 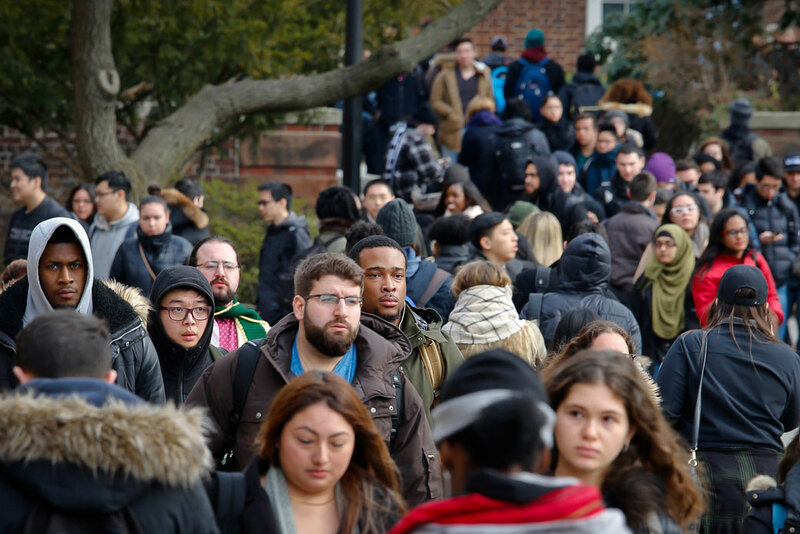 From their start, federal aid for college has emphasized access and extending opportunity to underrepresented populations without any discussion of these other issues. However, it is clear that achieving the overall goals of federal financial aid can no longer be met by just looking at whether students enroll in postsecondary education. The first step in adopting a broader mindset around the role of accountability and federal aid is for policymakers to identify which of the areas listed above are not addressed at all. For instance, there are currently no federal standards related to completion or concerns about equity. In other cases, policymakers need to review whether measures that might address an existing problem are actually effective. For instance, cohort default rates may no longer be as well-suited to capturing the full suite of student loan struggles, and there may also be a need to judge institutions based upon loan repayment rates. Saying oversight should focus exclusively on outcomes is a powerful messaging strategy. Unquestionably, the federal government should have more and better measures that look at the outcomes of students after they leave higher education. But better outcomes measurement cannot fully replace upfront accountability structures and ongoing monitoring. Outcomes will always take time to calculate, creating a lag before worrisome institutions are caught. The substantial due process rights afforded to institutions also means that even seemingly clear-cut cases of unwanted behavior can be litigated and appealed for years—requiring substantial use of limited government resources. Stronger upfront and ongoing accountability may also allow for greater flexibility and creativity in judging outcomes and attaching consequences, because these processes can root out the worst schools before they access substantial amounts of federal financial aid. Once a school is approved for federal student aid, it receives access to the full suite of student-based loans and grants. There is effectively no cap on how much money an institution can receive—the only factor limiting federal revenue is the number of students a school can attract. This means gatekeeping accountability must be effective in rooting out educational providers that already have red flags, such as by denying federal aid access to institutions that seem financially unstable. Rejecting business models that are unclear, have a leadership structure that seems underqualified, or other issues is another example. If the gatekeeping accountability process breaks down, the rest of the system will spend too much time trying to terminate aid eligibility for institutions that never should have been admitted in the first place. Removal requires large amounts of resources, because institutions in the federal aid programs have extensive due process rights and there is a strong bias toward avoiding actions that could create student disruption. It also means that countless students will be harmed and federal resources wasted in the interim—from the time a unfit college first gets access to aid and until when it ultimately loses that funding. Ongoing monitoring addresses the reality that some institutions deteriorate. A school’s leadership or ownership can change. Colleges that were well-run and adequately served students for years can become predatory institutions in a matter of months. Real-time monitoring still serves a purpose even when colleges do not change hands. It can act as the proverbial canary in the coal mine, identifying future issues, as well as dissuading unwanted behavior. Shaky finances, for instance, might lead to sacrifices in program quality or raise the possibility of sudden closure. Failing to properly account for federal money can be an indicator of potential fraud, while high dropout rates could suggest future loan struggles. These are all worthwhile issues that cannot be addressed only with gatekeeping or outcomes-based accountability. Examining the outcomes of a school’s former students provides an independent assessment of that institution’s results and ensures that it cannot hide all its problems. For example, an institution might have a high graduation rate in its certificate program because the program lacks rigor. That problem might then appear in the form of high default rates or low job placement rates. Policymakers need to better differentiate the roles of upfront, ongoing, and outcomes accountability. This should start with clearer outlining of the roles and responsibilities of the triad—states, nonprofit accreditation agencies, and the federal government. This includes more regular communication and attempts to align efforts that might be overlapping, such as how each party considers finances. It also requires understanding that the triad is not consistent across institutions. For many private colleges, the state role looks different than it does for a public institution. This will help clarify where the federal government may need to step up its upfront work versus what accreditors can do on ongoing monitoring, and so forth. Next, policymakers should consider where gatekeeping, ongoing monitoring, and outcomes-based accountability currently come up short. For instance, the fact that many problematic colleges morphed out of seemingly successful enterprises suggests a need for more rigorous focus on overseeing proposals to change ownership or to radically alter the educational enterprise. In particular, new ownership should be treated with just as high a bar as initial gatekeeping. There are unquestionably some colleges with such poor outcomes that they should not be in the federal financial aid programs, but there are even more institutions whose outcomes are simply mediocre—not disastrous but not nearly good enough. Accountability needs to encourage a broader set of institutions to improve. If it only focuses on the worst institutions, then the government will expend a great deal of energy tracking down tiny colleges whose status at the bottom is more likely a result of being a small family-run business than intentional bad behavior. Unfortunately, most current measures of federal accountability operate on a narrow approach that only targets the lowest-performing colleges. This makes some sense—the worst performers are, after all, a greater concern than mediocre ones. But this approach undermines the broader effectiveness of an accountability regime by creating substantial cliff effects. An accountability cliff effect occurs when there are some bright line performance standards but no penalties as long as a school avoids that threshold. Cohort default rates are an excellent example of a cliff effect in federal policy. Institutions with a default rate of 30.1 percent for three years can lose access to federal financial aid. Meanwhile, a school whose default rate is 29.9 percent for the same period of time has to do nothing more than submit a default management plan. As a consequence, a school with a 20 percent default rate—still rather mediocre—does not have much incentive to improve at all. The approach used by most federal accountability measures, therefore, is self-limiting. All an institution has to aspire to is mediocrity—and accountability falls away. Policymakers should change accountability systems to ramp up consequences and encourage more institutions to improve. For instance, institutions with mediocre results might be required to develop more generous refund policies for students; the next set of colleges might face financial consequences such as a letter of credit; and the final group would risk losing access to financial aid. The idea is that more institutions have an incentive to improve. Effective accountability requires consequences that are serious enough to push institutions to take action to avoid them. But consequences must also be proportional to the problems observed so that the actor enforcing the rules—in this case the federal government—can actually administer them. The major federal accountability processes have a range of consequences that is too narrow. For instance, the only major consequences from having a high cohort default or 90/10 rate is loss of federal financial aid. The financial responsibility scores requirement is the only one of these high-profile measures to address the consequences issue. Institutions facing problems under this measure first submit a letter of credit before losing access to financial aid. While removing access to federal financial aid must be on the table, it is a difficult consequence to use. Given that many institutions would not survive without the revenue from federal aid, this penalty is a de facto nuclear option. As a result, what should be a powerful leverage point is also so overwhelming that wielding it becomes nigh impossible. Cohort default rate penalties provide an example of how having federal aid loss as the only meaningful penalty available can undermine effectiveness. In 2014, colleges were supposed to start facing a loss of federal financial aid if they had high three-year cohort default rates—the new measure was phased in after the 2008 Higher Education Act reauthorization. However, the Department of Education made technical adjustments to the rates for many schools that would have otherwise failed, allowing them to avoid losing access to aid.90 The agency preemptively undercut its own accountability measure because it recognized the political infeasibility of letting many colleges lose access to aid. Even if terminating federal aid is not an option, the threat of potential closure can be a powerful tool for institutions to push back against accountability efforts. For example, one major argument against the use of letters of credit is that they are often assessed on institutions that are already on shaky financial ground.91 Some schools that already cannot pay their bills argue that adding another financial commitment will simply hasten closure. The limited range of penalties means that there are substantial missed opportunities for using federal policy to encourage improvement. For instance, the current federal accountability mechanism gives no consideration to what type of changes might improve a school’s results. New leadership, revamping governance structures, redirecting greater spending toward instruction, improving student support services, or increasing proactive advising are reforms that could improve an institution. Surely, some schools do adopt these measures in response to accountability challenges, but nothing forces such behavior. Loss of financial aid cannot be the lone accountability consequence. The federal government should make greater use of financial tools, such as delayed financial aid payment, requiring schools to share in the risk when student loans go bad, or letters of credit. Policymakers should also explore nonfinancial consequences. This could include things such as required changes to institutional leadership or board membership or requiring outside support to help an organization run better. Admittedly, these more granular changes may be better-suited to exploration first through accreditors. Where possible, alternative consequences should not rely on the submission or creation of plans, which in federal higher education policy are often make-work exercises that are not particularly effective. Institutions need to feel like accountability measures can be fairly attributed to the federal funds that are at risk if a school comes up short. If the performance metric and the consequences feel too disconnected, then a measure can lose validity or have weaker incentives for institutions to improve. The cohort default rates measure provides an example of both effective and unproductive ways to align accountability metrics and consequences. On the effective front, this measure directly puts student loan funds at risk if too many of an institution’s borrowers have a poor loan outcome. The theory is clear—if a significant number of students defaults on their debts, then it does not make sense to keep offering loans at that institution. But cohort default rates also put Pell Grants—which do not have to be repaid—at risk. This is a connection that can make cohort default rates seem unfair to some schools. At some institutions—particularly community colleges—the number of borrowers is much lower than the number of students who receive grants. In those cases, even if a college improves its default rate, there’s no guarantee that the outcomes for grant recipients will improve. It also means that the results for a small set of students puts assistance at risk for a much larger population. Policymakers should find a better measure for holding institutions accountable for Pell Grants than the cohort default rate. This could be done through a measure of completion, withdrawal, or something similar. To be clear, the tie between default rates and Pell Grants should not be cut without a replacement. Otherwise, even the minimal accountability that is connected to that program today would be lost. Sanctions and consequences must be a part of any accountability system for federal financial aid. But a system that only has punitive measures risks encouraging behavior that aims only to avoid problems, rather than proactively trying to improve. Including some kind of reward for good or improved results as part of an accountability system is particularly important for heading off concerns that institutions may avoid serving at-risk students. Accountability regimes should not discourage otherwise high-quality schools from extending opportunities to the individuals that most benefit from postsecondary education and training. Accountability systems should also include opportunities for some kind of reward or bonus. This could come in the form of monetary support such as additional funds to help schools that are doing a good job. It could also mean giving institutions priority in formulas for distributing money in the campus-based aid programs, which give additional grant aid to low-income students or provide subsidized employment opportunities. One strength of the federal financial aid system is the wide variety of institutions that participate in it. These aid programs support everything from a huge research institution preparing the next generation of scientists to small family-run schools that teach students to cut hair. Given this diversity of schools, it would be illogical to hold all of higher education to the exact same set of measures. For one, colleges’ organizational structures vary. A public college typically has additional layers of state oversight to go through and is also backed by the full faith and credit of its state. This provides greater confidence that some part of the state government has assessed the quality of its programs and that it is not at risk for sudden closure the way a private institution might be. Therefore, a public college does not need the same financial monitoring processes as a private institution. Similarly, the fact that a private for-profit college has owners that can pull equity out of a school represents a unique risk that must be addressed. The risk that an institution presents both to students and taxpayers should also inform accountability. In general, institutions that receive greater amounts of federal financial aid and have larger enrollments should be bigger concerns, because negative results affect a larger number of people. Similarly, it is reasonable to consider past performance problems or red flags in setting up different accountability regimes and requirements. Accountability need not be a one-size-fits-all system. But that does not exempt institutions from being held accountable for performance on key issues. For instance, all institutions should be judged on student loan outcomes. Similarly, all schools need some sort of financial monitoring. Policymakers should review different parts of the accountability system to differentiate by institution type, size, and riskiness. For instance, the operations of a large publicly traded college are different than those of a small owner-operated beauty school. Policymakers should also explore where accountability measures need calculation tweaks to reflect institutional diversity. For instance, the formula for calculating completion rates cannot be a one-size-fits-all measure. Shorter-term programs will always have higher graduation rates than longer-term ones, because there is less time to drop out. Therefore, it is important to have different completion standards based upon length of programs offered. There are several proposals for new or alternative forms of postsecondary accountability that Congress could address during the reauthorization of the Higher Education Act. Many of these ideas are very promising, but they are also quite complex and require additional thinking before they could be adopted. Below is a brief summary of each of these measures, as well as outstanding questions about these proposals that would need to be addressed. What is it? Earnings are a measure of the amount of money graduates earn after leaving school. Some proposals call for looking at the percentage of graduates who earn above a set threshold, such as $25,000 annually. Others look at the size of annual student debt payments graduates make as a percentage of income. Why have some organizations called for it? Earnings are a popular tool for measuring whether a higher education program produces a sufficient return on investment. While earnings are by no means the only valuable outcome from a college education, they are of high interest to students, especially if they have loans to repay. Judging an institution or a program of education in a way that somehow incorporates student earnings can provide a valuable feedback loop about how much programs cost or the level of debt students take on. Has this it been used? Gainful employment judges career training programs based upon the annual debt payments of graduates compared to their income. The College Scorecard reported typical earnings data and the percentage of students making above $25,000 a year for both graduates and dropouts from institutions. What are the two biggest unanswered questions? The first question concerns the proper way to measure earnings. All proposals around earnings so far focus on using earnings in context, either by looking at the share of students above some benchmark or the level of earnings compared to the amount of debt borrowed. Within this are some more basic details around how many years after graduation earnings should be measured. The second question pertains to the types of higher education institutions that should be judged by their graduates’ earnings. There is general agreement that earnings are a good measure for career-oriented programs but more debate over their use for other options. Whether it should apply to institutions and programs of all types, and exactly how it should be applied, will be a major point of discussion going forward. What is it? The repayment rate is a measure of whether students make progress paying down their debt. Why have some organizations called for it? Repayment rates are often viewed as superior to student loan default rates because they take a more expansive view of what it means to hold institutions accountable for students who struggle with debt. Repayment rates hold institutions accountable for having large numbers of borrowers who never default but who fail to make enough payments to ever make progress retiring their debt. This could be because institutions push too many borrowers to pause their payments using a deferment or forbearance or to make payments based upon their income that are less than the amount of accumulating interest. Because repayment rates capture these additional student loan struggles, they are also more difficult to manipulate than cohort default rates, making them a stronger accountability measure. What are the two biggest unanswered questions? The first question concerns what successful repayment should constitute. This could be defined in multiple ways: For instance, borrowers could have to repay at least $1 of what their principal balance, or borrowers could have to pay down enough of their outstanding balance to put them on track to retire their debt in 20 years or less—the point in time at which borrowers can receive forgiveness. It could also be some totally different formula. The second question pertains to the treatment of borrowers who do not cover all their accumulating interest on income-driven repayment plans. These plans are presented as a safety net for borrowers. Treating someone who uses those plans as having a negative outcome even if they are making all required payments could be viewed as unfair. What is it? Risk sharing is a requirement for institutions to repay some share of loan volume when student borrowers run into trouble, such as default or nonrepayment. Why have some organizations called for it? Risk sharing can reorient the current financial incentives around student loans. Currently, the costs of unpaid student loans are shared between the taxpayers—through debts that are not collected on—and students, who must pay back the loan plus collection costs. Institutions, however, have no substantive stake in this process. As long as they keep their default rate below a certain threshold, they do not have to worry about their school’s loan performance. Risk sharing changes that dynamic. Having institutions partially responsible for loans that go unpaid creates an incentive for them to focus more on serving borrowers. Some proponents of risk sharing suggest it could replace other accountability measures. Has it been used? No. Student loan companies used to be responsible for 3 percent of the balance of each loan that defaulted. But they received other subsidies that distorted potential effects of this risk-sharing requirement. What are the two biggest unanswered questions? The first question deals with the design of the risk-sharing system. This includes numerous details, such as the measures that should be used to calculate when a school owes payments—default or repayment rates. There are also questions about whether institutions should pay a set share of each loan that goes unpaid, some amount that escalates as problems worsen, or follow some other formula. The second question addresses how schools would respond to a risk-sharing system. Given that it has never been tried before, it is unclear whether schools could afford the payments, if it might result in denying services to underrepresented students that are deemed a greater financial risk, or other unintended consequences. Understanding the response to the measure is important for knowing if risk sharing could accomplish its desired ends. The federal investment in higher education is an extension of taxpayer trust to the tune of billions of dollars a year. The risks that accompany this investment are born not just by the public, but also by the students who must repay federal loans, as well as devote time that they cannot get back. Availability of financial aid from the Department of Education is at least a tacit endorsement that the federal government believes a given educational option is safe to pursue. This is a commonly accepted role in other realms where the federal government works to ensure that the food its citizens eat, planes they fly on, and cars they drive all meet minimum standards for safety. As this paper highlights, similar baseline safety claims cannot be made about the federal financial aid programs. Fortunately, most institutions of higher education want to do the right thing, and most student loan borrowers successfully repay. However, this lack of protections does create openings for unscrupulous institutions, and schools that mean well but still produce poor outcomes are not pushed to do better. The Education Department, of course, cannot go it alone on accountability. More work on strengthening the triad between the federal government, states, and accreditation agencies must occur. Roles, responsibilities, and expectations should be better defined. But improving federal accountability cannot pause while the triad is reworked. It has been nearly 10 years since Congress examined accountability standards and even longer since most accountability measures were conceived. With Congress currently discussing the Higher Education Act, the opportunity exists now to examine the accountability regime. As this report showed, federal policymakers need to do a better job holding colleges accountable for what really matters through a mixture of gatekeeping, monitoring, and outcomes-based measures that mutually reinforce one another. It is crucial to encourage improvement—not just closure—and to do so through a flexible mix of consequences. It is time for an accountability refresh.